Today’s the day we cast on our Sporty Forty shawls. And it’s also Elizabeth’s 40th birthday! We have some helpful tips and tricks to get you started on your Sporty Forty shawl. The shawl features increases and stitches that are great for a beginning knitter or someone more advanced looking for a fun, relaxing project. Sounds perfect! Let’s get started. Download your pattern if you haven’t yet. Grab a yarn kit if you’d like to knit this project! Sporty Forty uses 2 types of increase techniques in order to create its shape. Yarn-overs (YO) are used on either side of the center stitch on right-side rows and the knit-front-and-back (kfb) technique is used on either end on both right-side and wrong-side rows. A kfb is an easy way to increase 1 stitch and looks especially well when worked in Garter Stitch (knitting every row). If you have never worked a kfb before, check out the photo tutorial below! One of the most straight-forward types of increases used in shawls are yarn-overs (abbreviated “YO”). In Sporty Forty, I used YO’s on either side of the center stitch – it’s both an easy way to add stitches (which is what helps to shape the shawl), as well as provides a pretty eyelet detail (and in keeping with the “Forty” theme, I made sure there would be 40 eyelets down either side of the center of the shawl!). In this piece (and many other similar types of shawl/kerchiefs), you have a single center stitch that has markers on either side, and a YO is worked before the first marker and after the second marker on every right-side row. What can be tricky about this is that when you work that first YO, and then you slip your marker, you have to be a little careful that as you knit that single center stitch, that the YO you are creating doesn’t slide over the marker, causing there to be an extra stitch in the center. Now you’re all set to knit your Sporty Forty shawl! Be sure to check in and say hello by either leaving a comment here or tagging #SportyFortyKAL on social media. We’d love to see your project! Elizabeth and Heather are hosting a fun, easy-going KAL starting on Elizabeth's birthday and ending on Heather's. Grab a kit and join in the fun! KAL Kits + Pattern go live: Friday, March 1. Read the details. KAL Start Date: Tuesday, March 12, 2019. KAL End Date: Wednesday, March 20, 2019. 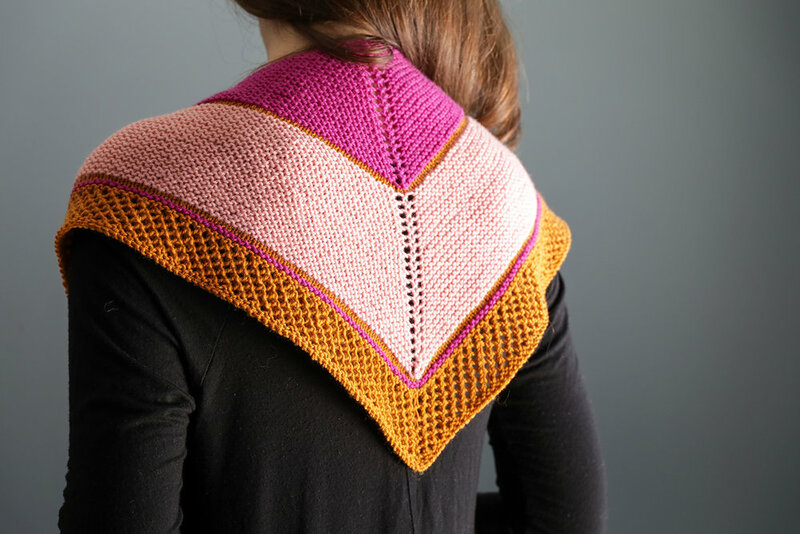 Get the yarn: We put together 8 yarn kits to work with this shawl pattern and guess what?! They’re $40! See the color options for the Sporty Forty yarn kits below. Elizabeth and I realized that our birthdays are just days apart and we’re both turning THE BIG FOUR-OH. What better way to celebrate this milestone than with a collaboration between Elizabeth Smith and Ewe Ewe Yarns! Elizabeth designed Sporty Forty, a heart-shape-inspired shawl, with Ewe So Sporty Merino from Ewe Ewe Yarns. Her wonderful design skills are highlighted in this shawl with a simple garter stitch, surprising pops of color and an easy eyelet border edge. Isn’t it great? Look at those little hints of color happening. How fun! To celebrate this great new collaboration (and our big birthdays!) we decided to have a birthday knit along. It’s a fun way for friends to have some birthday fun while being on opposite sides of the country. I hope you’ll join us! KAL Kits + Pattern go live: Friday, March 1. KAL Start Date: Tuesday, March 12. KAL End Date: Wednesday, March 20. Pin now to have a reminder!